The latest in the series that began with a live sketch and continued through several iterations, showing different ways of looking at the same scene. This is a gallery-wrapped oil on canvas painting, 24x30. Thank you for taking the time to enjoy my art. 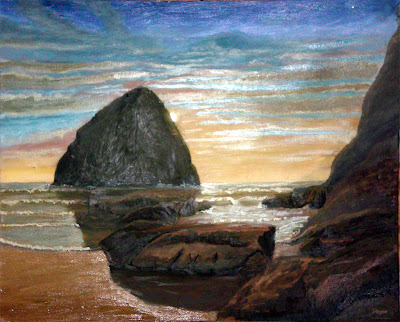 I'm reading: Cape Kiwanda Sunset #10 (Oil Painting)Tweet this! Wow! This piece is absolutely beautiful. I *think* it's my favorite. Thanks for the post on my blog, by the way.